All transactions are safe and secure with a reliable history in online purchasing behind each of our associates. 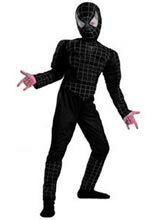 Buy the Black Spider-Man Costume to own Spider-Man clothing and merchandise. Bring the dark side of Spidey to life in this silver and black costume featuring a jumpsuit with muscle torso and over the head character hood with reflective mesh eye inserts and web print. The black Spider-Man costume is based on Spidey's black outfit from the movie Spider-Man 3. In the film, the symbiote alien Venom bonds to Spidey, temporarily distorting his ordinarily good intentions. Wear this costume with your favorite Venom Spider-Man tee shirt underneath. Just remember to retain your superhero (good guy) ways. In addition to the Black Spider-Man Costume above, browse the Spider-Man Clothing Gallery for more apparel like men's and women's clothes, kids shirts or hoodies.